The kids may be away at summer camp, but its never to early to think about Halloween! A staple for the last few decades – the UNICEF Trick-or-Treat box – is getting an upgrade. You may remember seeing this box that helps kids collect donations for UNICEF on past Halloweens. But this year, your kids don’t have to tote around a box of loose change because the Trick-or-Treat boxes will now be outfitted with Microsoft Tags – enabling donors to give online by scanning a barcode with their smartphone. Microsoft Tags are those square digital codes like QR codes. Each barcode is scanned with a smart device, which then brings the browser to a special UNICEF Trick or Treat website. In early years, the UNICEF donations were allocated strictly to schools, but in recent years, the expansion of UNICEF has opened the donation gates to many different charitable programs. Modern UNICEF programs still include schools and education for kids, but also encompasses foreign aid. For example, one campaign helped feed Somalian children and provide them with health supplies, despite a ban on all other foreign aid. The donation website also features educational games and activities for kids. But more importantly, it educates donors on the logistics and details of UNICEF’s programs. People want to know where their dollars are going, and when the internet is introduced, it can seem a vague and distrusting place to donate your dollars. But through the new Trick-or-Treat program, UNICEF hopes to nip this problem in the bud giving donors another forum to explore (and potentially donate more), while letting them know exactly where their donations go and how they help. If you’re willing to start thinking about goblins, pumpkins, and Halloween night, you can pre-order Trick-or-Treat boxes for your school or community now through UNICEF. The kids may be away at summer camp, but its never to early to think about Halloween! 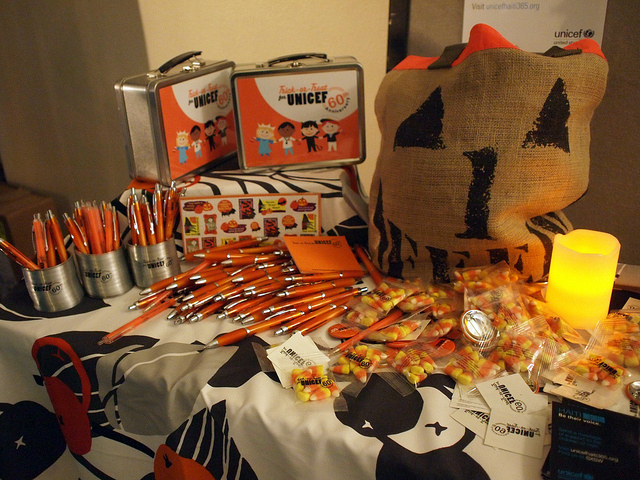 A staple for the last few decades - the UNICEF Trick-or-Treat box - is getting an upgrade. You may remember seeing this box that helps kids collect donations for UNICEF on past Halloweens. But this year, your kids don�t have to tote around a box of loose change because the Trick-or-Treat boxes will now be outfitted with Microsoft Tags - enabling donors to give online by scanning a barcode with their smartphone.